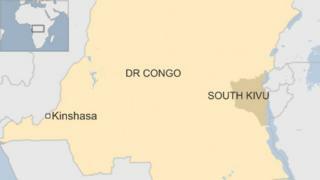 At least 30 people have been killed in an inter-ethnic attack on a village in the South Kivu region of the Democratic Republic of Congo, say local officials. Witnesses say the dead included women and children, some killed inside a church where they had been sleeping. All the victims were of the Bafuliru ethnic background. It was not immediately clear who had carried out the attack, but the region has seen ongoing conflict between the Bafuliru and Barundi communities. "It was about a dispute over cows," South Kivu governor Marcellin Cishambo told Reuters news agency, putting the number killed at 27. "The problem is that everyone in this area carries a weapon." One local councillor put the number of dead at 33, telling AFP they were "eight men, 14 women, 10 children and a soldier", and that another 28 people were wounded. A Reuters reporter said the victims had been shot, stabbed or burned in their homes, and that some of the women were pregnant. Eastern DR Congo has been wracked by conflict since 1994, when Hutu militias fled across the border from Rwanda after carrying out a genocide against Tutsis and moderate Hutus. Around a dozen armed groups still operate in the region, many taking advantage of the weak government to seize the control of the area's rich natural resources.